Replacement lillian cord is something you'll probably never need. The lillian almost never breaks and it is rare for it to get pulled off the rod tip. Having the lillian pull off does occasionally happen, though. It has happened to me twice and I know it has happened to other people (with rods of various different brands). I suspect it happens more often to people who use stronger tippets, but I don't know for sure. In any event, having some replacement lillian on hand can keep you fishing if the lillian does get pulled off or if you happen to break off the rod tip. Just as the "universal" rod caps aren't truly universal and actually come in different sizes, lillian cord also comes in different diameters. The Small is appropriate for seiryu rods, most keiryu rods and some tenkara rods (those with a dip diameter of .7mm or less - when in doubt ask me and I'll look up the tip diameter for you). The Large is appropriate for rods with larger tip diameters. The Large is much easier to get onto the rod, but it may be too large to allow you to remove the tip section from the second section on the seiryu rods. You no longer have to choose which to order, though. I now include some of each in the package. Replacing the lillian is not particularly difficult. I think I've seen a couple videos on how to do it, but one of them advocates a method I absolutely, positively would never use, and would not recommend you use either. There is no way I would ever use a lighter to try to stick the lillian onto the rod tip. It only sticks if the nylon gets hot enough to melt onto the rod tip, but if you get nylon too hot it will burn. Given that all the Japanese rod companies include warning pamphlets that instruct people not to keep a rod in a car trunk on a sunny day, I have to think that the heat from a hot car (which is never hot enough to melt nylon!) or the heat from a lighter are not particularly good for your rod tip. I don't know if it is a common practice in Japan but I still would not do it and would not recommend it. I have used both super glue and epoxy. I think epoxy is the better solution. The lillian will wick the super glue into the portion of the lillian that is beyond the rod tip so you have to be careful to put the glue only on the rod tip itself and also right around the very end of the lillian Drug stores carry superglue in small, convenient "single use" tubes. You can use one of those for emergency repairs at streamside. If the Postal Service did not forbid the mailing of glue, I would carry it and provide it with the replacement lillian. As it is, the best I can do is supply the lillian. For repairs at home, I would use epoxy. This is how I would replace the lillian. I have only had to do it a few times, but it worked and did not risk melting the rod tip. Important: Do not remove the tip from the second section before gluing on the new lillian. It might then be too large to go through the second section. To replace the lillian, first scrape off any dried glue from the tip section. Then slide on the new lillian about 1/2 - 5/8” (just to make sure you can get it on far enough). Slide the lillian most of the way back off but not all the way (leave about 1/8” on the rod). Wet the next 1/2” of rod tip with epoxy or superglue and slide the lillian over it - quickly, before the glue gets too tacky. (Epoxy and superglue both work, but I think the epoxy forms a better bond.) About 5/8” of the lillian should be on the rod. Saturate the very end of the lillian to bond the end of the lillian to the rod. If you use superglue, do not saturate all the way to the rod tip. 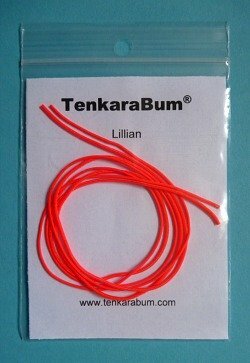 The lillian will act like a wick so you do not need to saturate it all the way to the rod tip - and if you do, the lillian will wick the glue beyond the rod tip and the lillian will be stiff rather than flexible. If you use epoxy, wipe off the excess or it surely will not pass through the second section. Gluing lillian to swivel tip: Same as above, except - dip only the thin portion of swivel in epoxy, slide lillian only over thin portion. DO NOT get epoxy past thin portion of swivel or swivel will no longer spin. LET THE EPOXY CURE THOROUGHLY BEFORE COLLAPSING THE ROD. The last thing you want to do is glue the rod tip inside the second section! Please note: each package contains enough material to replace the lillian on several rods. No need to buy two packages if you have two rods. One package is more than a lifetime supply for the average tenkara angler.